Even after an exhausting morning defending the ranch against a vicious one-eyed robot, Hank the Cowdog, Head of Ranch Security, still has energy left to supervise Little Alfred’s fishing trip. But what starts as a routine expedition turns into a first-class crisis when Hank reels in more than he bargained for. A fishhook finds its way into Hank’s stomach, which is bad news indeed. Is there hope for Hank, or is this curtains for our hero? 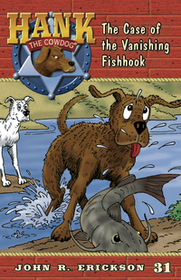 Find out in this hair-raising, hilarious adventure starring everyone’s favorite cowdog.